Fort Clay was one of two forts built by the Union Army in Lexington during the Civil War. The fortification was constructed in 1863 on the southern ridge of the Davis Bottom valley to guard Versailles Pike, a strategic road leading into the western end of downtown Lexington. Fort Clay was built in response to a raid by Confederate General John Hunt Morgan on Union troops camped at Ashland, the estate of Henry Clay. The fort was planned and constructed by Captain T.B. Brooks, New York Volunteer Engineers, under the direction of Brigadier General Q.A. Gillmore. The official U.S. Engineers survey map (right) shows it was a star-shaped structure with earthen and wood embankments and a surrounding ditch. 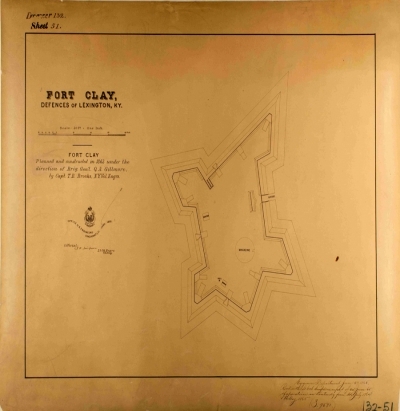 Figure: 1 “Fort Clay, Defences of Lexington, KY.” U.S. Engineers survey map printed June 1865. Courtesy, National Archives. Full article on Fort Clay with additional maps and garrison information. Fort Clay was designed with 12 artillery batteries, two mortar emplacements, a well, a magazine and a gated drawbridge facing the Davis Bottom valley. Based on archival accounts, the fort was built by Union troops and local African American men who were conscripted into service. Fort Clay was pressed into battle during Confederate General John Hunt Morgan’s final raid of Lexington on June 8, 1864. Morgan entered the city with about 2,700 men to procure horses and supplies. The Union troops based downtown fled for the protection of Fort Clay, which had a garrison of 800 men, including about 300 U.S. Colored Troops. Confederate troops looted Lexington (Morgan’s hometown) and set fire to several buildings to make their forces look more imposing. Fort Clay’s artillery batteries fired numerous salvos at the Confederate soldiers setting fire to stockpiles of wood at the Kentucky Central Railroad building near the Lunatic Asylum (now Eastern States Hospital).